The very busy Vancouver Downtown Association decided to do a fresh public art piece many months ago. The process of developing and implementing a project like this takes a commitment from employees, volunteers, artists, and donors. From concept to construction to installation, it is a loving labor- a gift from one group of people to generations of residents and guests to come. Cobalt Designworks’ Dave Frei and Jennifer Corio created this large metal and basalt piece. After an open call for proposals, theirs was selected by a volunteer public art committee. Uptown Village also has a similar process underway for a new piece of public art. Public art adds interest, flavor, and let’s face it, a little spirit to our streets and parks. The folks who make these projects happen do it from a place of generosity. The VDA will dedicate the Founding Mother’s Sculpture at noon this Friday, November 6, at Esther Short Park’s Propstra Square. In addition to local leaders, artists, and community members, the women’s choir from the Vancouver School of Arts and Academics will perform a folk song. Raising awareness of the richness of our history and the talent of our local artists are good reasons to gather. 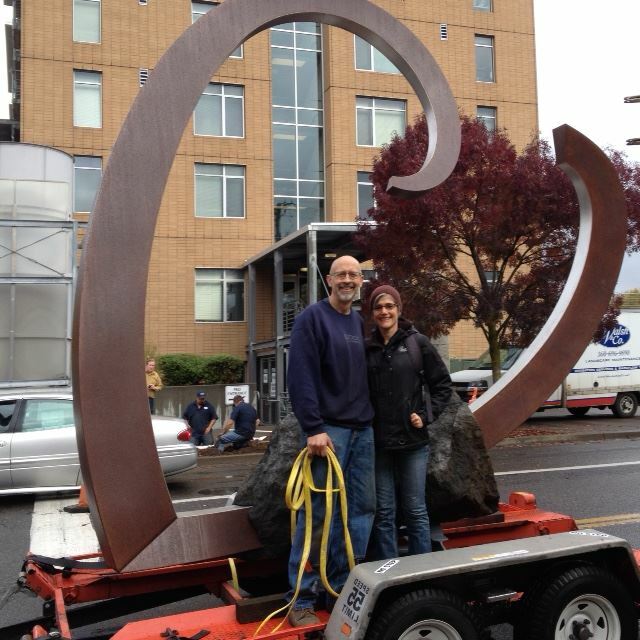 Dave Frei and Jennifer Corio bring in their piece “Heart and Stone”. 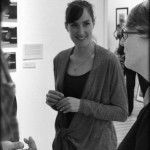 Photo courtesy of VDA.